According to the Independent, Arturo is thought to be depressed following the death of his long-term companion two years ago; video footage shows him traipsing despondently around a small enclosure and gnashing his teeth, which experts say is "abnormal" behavior. The experts also note that polar bears are, uh, you know, built for the cold, and temperatures in the Mendoza Zoo can reach up to 104 degrees Fahrenheit. Which is really awful and dangerous. 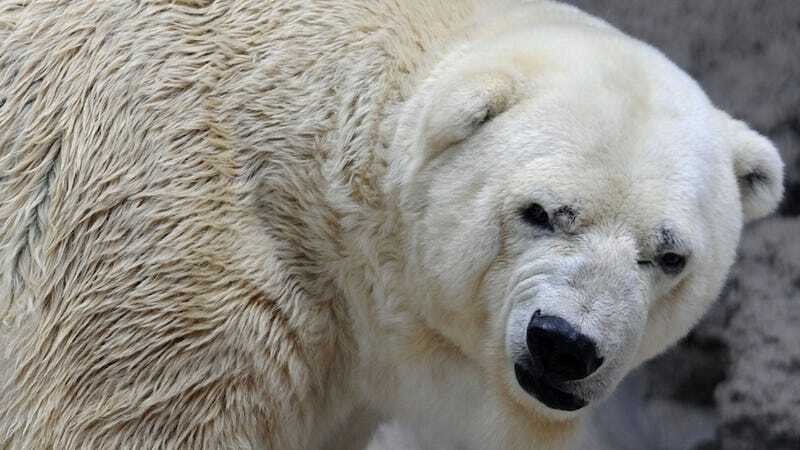 For months, protesters have demanded that Arturo be moved to the Assiniboine Park Conservancy in Winnipeg, Canada, a place where it is not ever 104 degrees. Unfortunately, however, the Mendoza Zoo lacks the paperwork required by the Canadian Food Inspection Agency in order to take an animal into the country. In addition, the zoo's medical board decided unanimously that Arturo is too old to be moved because doing so would pose risks to his health (but keeping him in a tiny, dirty hot tub is totally chill, they all agreed). As Rob Laidlaw of Zoocheck Canada told the Mirror: "Arturo is in distress. They say there's a risk if he is moved. But the risk is worth it." FREE ARTURO.